The beautiful campus of the Australian National University is nestled in the heart of the country’s bush capital, Canberra. I attended the ANU in the 1980s, majoring in geography and prehistory. In my first prehistory tutorial, I recall asking my tutor whether we had to remember dates to pass the course. I’m not sure who laughed louder: the tutor or my classmates. But jokes aside, I could tell I was being taught by world leaders in their field – people would tell me how lucky I was to be there. Professor John Mulvaney was the big-name head of the department, the person who really started the discipline of prehistory in Australia. I remember him striding into the lecture theatre with a Kodak Carousel brimming with slides of spectacular archaeological digs, ready to shape our understanding of who we were as human beings. The other name from that time that has stuck in my mind is Colin Groves, already well-known as the taxonomist who, with Vratislav Mazák, identified the type specimen for Homo ergaster. Groves’ lab was stuffed full of the skeletons of all sorts of primates. Hominid skulls were lined up on a bench, with humans at one end. A visit gave you the feeling of someone working at the frontier of their discipline, yet with a 19th-century aesthetic. Ever since that ANU experience, I’ve been fascinated with evolution, with how humans have developed on Earth. So when I started in business storytelling, I found myself wondering how it was that every culture seemed to share stories. I also wondered why they were so deeply embedded in our psyche. We don’t dream in facts or arguments or opinions – we dream in stories. Of course, a full explanation of this is not my aim here. That would easily consume a whole book. Plus this area is far from cut and dry. For example, researchers are still debating the evidence around the discovery of a new hominid species in South Africa, Homo naledi – the skeletons looked like they had been buried, suggesting some sort of ritual, but this can’t be said for sure, and so far it has been impossible to date these finds. Rather, I would like to give an account, supported by research, that explores my wonderings, and in the process describes why stories are so central to who we are as human beings. Let’s start with a quick primer on evolution by natural selection. In 1859 Charles Darwin published On the Origin of Species, showing how the process of natural selection explains how species have adapted and evolved over geological time. Darwin’s idea is simple yet explains so much. Take our own evolution. Because the copying process during reproduction is imperfect, every child is born with slight variations in their DNA – on average roughly 150 mutations. Most of these variations have no effect whatsoever and are rarely noticed, while some create problems such as heart defects that drastically shorten a child’s life. Others create new characteristics, such as greater height, a new eye colour, or an immunity to a virus. If any of these new characteristics helps a person survive and reproduce more effectively, they might be passed on to that person’s offspring. And as long as the variation continues to offer an advantage over the rest of the population, the people who have it grow in number, and ever so slowly our species adapts and changes. We have also learned to do things that affect our long-term biological make-up. For example, about 10,000 years ago, humans could not have tolerated drinking cow’s milk. But after cattle were domesticated, there was an oversupply of milk. It turned out that some people could drink it as adults because there was a variation in their DNA that tolerated lactose, so those people prospered and more lactose-tolerant offspring were born. This change happened over a relatively short time in evolutionary terms. Darwin knew he would be challenged over the speed of such adaptation, so he started On the Origin of Species with examples from pigeon breeders who could ‘produce any feather in three years, but it would take him six years to obtain head and beak’. Modern humans spread across the globe from possibly 250,000 years ago. There has been plenty of time for natural selection to work its magic. But what was the prerequisite for storytelling in the evolution of our species? What needed to be in place for storytelling to become an advantage? Humans are expert mind-readers, and you can see why. Even the simplest physical movement can have many meanings depending on the intention or goal of the mover. Say someone moves an object across a flat surface: Are they selling it, showing it, returning it, loaning it, trading it, giving it or perhaps just disposing of it? The observer can only understand what’s happening if they know the intention of the mover. But at some point in our evolution we developed shared intention, where two or more people joined together to get things done. This seems to be a uniquely human trait. Let’s think for a moment about our closest cousin on the tree of life: the chimpanzee. If a chimp sees a luscious piece of fruit hanging at the end of a branch overhead, but they cannot reach it no matter how hard they try, you will not see another chimp climb onto that branch and push it down so their buddy can grab the fruit. But early in human evolution, we developed the ability to notice the intentions of our fellow clansmen and then work with them to achieve a goal. 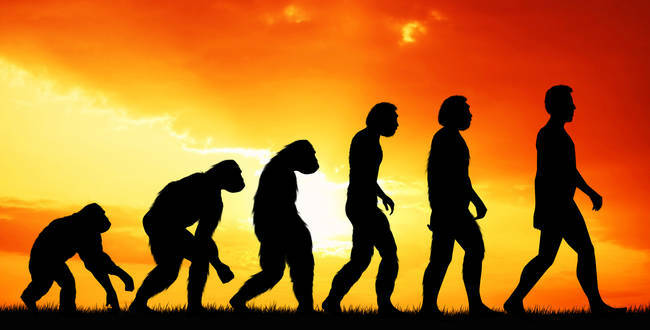 The director of the Max Planck Institute for Evolutionary Anthropology, Michael Tomasello, argues that shared intention emerged when our ancestors began facing pivotal dilemmas. Imagine, for instance, that you’re out hunting hares when you come across a stag in the forest. Immediately you can see the advantages in capturing the stag – more meat for about the same effort. The problem is, you can’t do it alone. If you could convince a couple of members of your clan to help out, however, there would be good food for everyone. According to Tomasello, this prompted a big change in thinking. Whoever embraced shared intentionality increased their ability to hunt, gather, raise children and raid their enemies. They survived, and they multiplied. The level of collaboration required to ‘capture the stag’ itself required a new way to communicate. Questions needed answering, as everyone needed to be on the same page before the hunt: ‘What did we do before?’ and ‘How well did that work?’ and ‘What are we going to do this time?’. All these questions were answered by sharing stories. At this stage, though, there was no spoken language. As Tomasello points out, ‘the first uniquely human forms of communication were pointing and pantomime’. Storytelling came before the spoken word, which makes it a truly ancient form of communication. The timing of this monumental change has been estimated by a number of researchers. Some say it coincided with the emergence of Homo heidelbergensis around 800,000 years ago. Others believe the best indicator is when we start to see large prey being brought back to the home base in the archaeological record, around 400,000 to 200,000 years ago. Interestingly, Homo sapiens emerged on Earth around 200,000 years ago. It looks like renowned Harvard linguist and psychologist Steven Pinker was on the money when he said, ‘The spoken word is older than our species’. We can add to that by saying that storytelling is older than the spoken word. I’m sure you have had that experience where you realise you don’t share the language of the people around you but you still need to communicate something to them. So you mime – you use gestures. When my wife Sheenagh and I were travelling across France in our 20s, we wanted to do some wine tasting but we didn’t really know what signs were advertising the activity. So as we drive down the Loire Valley, we just headed into the first vineyard that look inviting. As we drove up the gravel driveway, Sheen scrambled for our phrasebook. But when the owner approached our car, I just jumped out and mimed what we wanted. We were then given a terrific tour of the winery and tasted some of the Chinon region’s finest output. We achieved a lot that day through miming. Perhaps it wasn’t quite the life-and-death miming our ancestors would have engaged in, but it worked. Miming eventually led to spoken language, which probably coincided with the spread of humans from what is now the African continent across the rest of the world. Our ability to speak gave us the group-mindedness that helped us build larger communities and institutions. As we started to domesticate plants and animals 10,000 years ago, our population surged, enabling people to specialise because there was plenty of food to go around. And this ability to specialise gave us time to invent one of the great tools of human civilisation: writing. It has only been in the last 6000 years or so that we have translated the sounds we make into a complete writing system. But writing now dominates corporate life. Yet, at our core, our innate communication skills are miming and oral storytelling. Wood, B. A. (2005). Human Evolution: a Very Short Introduction. New York: Oxford University Press. Tishkoff, S. A., F. A. Reed, A. Ranciaro, B. F. Voight, C. C. Babbitt, J. S. Silverman, K. Powell, H. M. Mortensen, J. B. Hirbo, M. Osman, M. Ibrahim, S. A. Omar, G. Lema, T. B. Nyambo and J. Ghori (2007). ‘Convergent adaptation of human lactase persistence in Africa and Europe.’ Nature Genetics, 39(1): 31–40. Darwin, C. and J. T. Costa (2009). The Annotated Origin: a Facsimile of the First Edition of On the Origin of Species. Cambridge, Mass. : Belknap Press of Harvard University Press. Tomasello, M., M. Carpenter, J. Call, T. Behne and H. Moll (2005). ‘Understanding and sharing intentions: the origins of cultural cognition.’ Behavioral and Brain Sciences, 28(5): 675–91; discussion 691–735. Tomasello, M., A. P. Melis, C. Tennie, E. Wyman and E. Herrmann (2012). ‘Two key steps in the evolution of human cooperation: the interdependence hypothesis.’ Current Anthropology, 53(6): 673–92. Tomasello, M. (2008). Origins of Human Communication. Cambridge, Mass. : MIT Press. Dubreuil, B. (2010). ‘Paleolithic public goods games: why human culture and cooperation did not evolve in one step.’ Biology & Philosophy, 25(1): 53–73. Stiner, M. C., R. Barkai and A. Gopher (2009). ‘Cooperative hunting and meat sharing 400–200 kya at Qesem Cave, Israel.’ Proceedings of the National Academy of Sciences, 106(32): 13207–12. Pinker, S. (2014). The Sense of Style: the Thinking Person’s Guide to Writing in the 21st Century. New York: Viking. Mcbride, G. (2014). ‘Storytelling, behavior planning and language evolution in context.’ Frontiers in Psychology, 5: 1131. Fischer, S. R. (2001). A History of Writing. London: Reaktion. Great post Shawn: it’s really striking to think that storytelling came *before* the spoken word. This post reminded me of the quote from Lisa Cron: “Opposable thumbs let us hang on; story told us what to hand on to.” (“Wired for Story” (2012)). Love this article Shawn. I taught a basic understanding of Darwin’s theory to my class last term focussing on physical adaptation…Next time I teach it, I’ll have another part of the story to teach them!